The decline in Commodities opens the window for deflation.- so US 10yr yields look cheap at 1.82%! The sell-off in commodities started in Asia yesterday after the US had marched the complex higher on Friday on optimism that the weak US employment report could stir the Fed into QE3. Steep falls with Copper down near enough 2% yesterday along with other metals show that Asia views the problems in Europe as a bigger concern than the prospect of QE3. Europe, especially China, sells a lot of finished goods into Europe. After the elections of the weekend the Asian investors and industrial users certainly see a deeper recession in Europe than perhaps the European investors see themselves and subsequently a lot less demand for their goods..
Gold saw an even greater sell-off. On April 30th, Gold Futures fell $17/toz in a quick 5 min spell as 7000 contracts were reportedly sold. Each Gold contract is equivalent to 100 oz of Gold. So 21.77 Metric tonnes of Gold. Dealers and the press suggested that this trade was an error trade as the market bounced back, and some speculators bought gold assuming that the “error trade” would need to be reversed. The buying didn’t materialise and Gold gradually declined. Yesterday, reportedly 14000 contracts were sold in a very short time span. This drove Gold down $28 yesterday and through $1600/toz for the first time since Jan 3rd. There was some bounce back so that the Gold contract closed at $1604, but this morning Gold has seen further selling out of Asia hitting a low of $1577. Why the Sell-off? It seems very likely that the selling has come from one major Fund or Hedge Fund. Why- because the perceived risk of rising inflation has reversed and the prospects of at least disinflation globally is growing. I have never believed in the strong relationship between Gold and inflation, but nevertheless some Hedge Funds have made their raison d’être on the inflation fears. 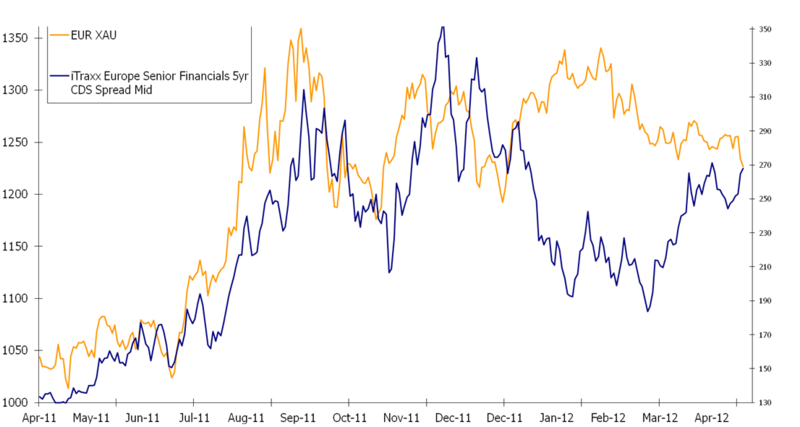 The market has to be fearful that there is further selling in Gold from this hedge fund in coming weeks. So Gold looks to be suppressed in US$ in coming weeks. But it will find some support from its safe haven attributes. Back at the beginning of March I showed that Gold was over priced in Euro’s given the level of Credit risk in Euro Financials. However I said then that the Itraxx Financial Credit spreads would reach 270, I expected it to happen before now, but this morning the iTraxx 5yr Financial CDS index is at 271bp. I suggested in March that Euro Gold would be around 1225 at that time, it is currently at 1224.50. So Gold in Euro is back to fair value I would suggest. Unfortunately I covered my short around 1250, when the Itraxx Financial index did last hit 270bp. But I didn’t advocate to go long at that time. There may be some more weakness on the US open in Gold today, fearful of another large sell-order, but Gold below €1225/toz and if Financial Spreads widen further, then It will be very tempting to go long again. And so back to Fixed Income. European Peripheral debt is once again under severe pressure. 10yr Spain is at 6% again and the new Greek debt is at the lows, most trading with a 17% big figure on the price. The Flight to safety and into Bunds is continuing , 10yr yields are now at 1.53%. The risk premium has widened as Eurozone inflation Swaps are not declining significantly as the Euro weakens, lessening the impact of falling commodity prices. In the US, the risk premium is not as strong but still there. 10yr German Bunds are trading 29% below 10yr US Treasury bonds. Given that the Eurozone crisis may become costly for Germany, I would believe that US Treasuries are set to benefit even more from a flight to safety. I would expect 10yr US Treasuries to outperform Bunds here and the yield differential to narrow to 10-15bp. It will mean that 10yr US Treasuries fall below the psychological 1.80% level, after the auctions of 10yr and 30yr bonds in the next two days.